The creation of the physical and mental challenges that make up a race is a multi-step process and focuses on two separate aspects of the race: flow and structure. “Flow” is the basic directional aspects of the race – the movement from one stop to the next. “Structure,” on the other hand, is determining what will make up the challenge at a given stop. Race design begins with choosing a potential city in which to hold a race. Currently, we have raced in DC, Nashville, and Austin. We have scouted Columbus, Denver, Portland, San Antonio, and New York. We hope to scout more in the coming year! Once a city is chosen and a basic structure is mapped out, we undertake a scouting trip by one of our team. The goal with scouting is to assess the locations from the basic structure and identify other possible locations, unique monuments, or quirky city features that might be of use in designing the race. Each scouting trip is heavily documented with photos and videos to share with the race design team, as this helps the designers better understand the city. A simple photo of a landmark is not enough for the design team to develop a challenge, so it is the scout’s responsibility to take photos of placards, unique markers, maps, pathways around the landmark, and even obscure objects around the landmark that could be used for clues. The next step involves intensive internet searches, especially using Google Maps and similar websites. Combining the scouting photos with these online maps is the essential component in determining flow and structure. In looking at the photos, even people unfamiliar with the city can become familiar with a particular landmark and the area around it. Then looking at the map as to where the landmark sits can place it in context, allowing for designers to consider what a potential use is for the location. Once a location/landmark is deemed suitable for a challenge, the design team must brainstorm the structure for the challenge. Sometimes the challenge is fairly obvious, such as spray painting an image at HOPE Outdoor Gallery in Austin, TX (pictured below). The HOPE Gallery, which is unique to Austin, allows anybody who has a can of spray paint to add a painting or tag to whatever they want on site, with the city de facto sanctioning the graffiti. Once the design team has determined good challenges for anywhere between five to eight locations, the next step is to determine a good flow. Looking at the map, the designer can slot the challenges into a desired order – we try to keep the route relatively circular, and sometimes we intentionally double racers back in order to keep them on their toes. After the flow is set, we have to write the clues. Writing the clues can often be one of the more difficult aspects of designing the race. If we reveal too much, the racers won’t have to think too hard and the overall experience will be more like an obstacle course – moving from point to point, completing challenges along the way. If we reveal too little, racers will be lost and require higher level intervention from staff at race HQ. The right mixture is a clue that, when closely read, can be figured out with a little bit of creative thinking. Much like on The Amazing Race (TV), when racers ignore the finer points of the written clue, they might end up frustrated or performing unnecessary work. 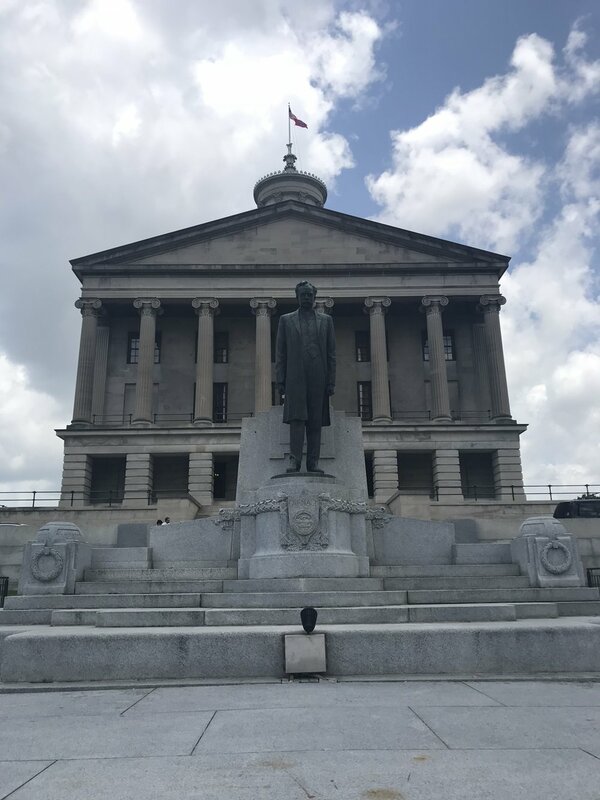 One of our favorite examples of written clues was the orienteering challenge we had racers do on the giant map of Tennessee just below the Capitol building in Nashville. For that challenge, we had racers start standing on the star icon for Nashville. We then told them to take X steps east/west/north/south. Then again. And again. And again. Etc. The problem we immediately identified, however, is that, without any signposts, racers could end up way off the final mark, which they would need to receive their next clue. To counter this effect, we added signposts in the form of crossword puzzle-like hints that followed each step. For example, when racers should’ve been standing near the town of Egypt, we added the hint “Are you in denial,” riffing off of the old elementary school joke (“the Nile” -> “de-nial”), which indicated that they should be standing on the town of Egypt. Finally, the last piece of design is running the structure and flow through multi-level quality control by other W2NR staffers who were not involved in the design. Not only does this help refine the race, identifying problematic clues and challenges, but it also previews for the staff what the racers will be doing on race day. I hope this look behind the scenes has been interesting and helpful. We look forward to seeing you at the next Where to Next? Race!